Fueled by his own expansive ideas about photography—as a tool of social commentary and contemporary experimentation—VSW and the MFA program were founded in 1969 by Nathan Lyons. Just a few years after the founding of the school, Nathan’s partner Joan Lyons founded VSW Press to give artists a place to print their own artists’ books and produce the work they wanted to make—not what was dictated to them by the commercial pressures of publishers, galleries, and museums. That ethos lives today in VSW, which nearly five decades later continues to thrive as a laboratory for leadership and independent thinking. Your donation helps VSW fulfill its mission in providing Gallery Exhibitions, Artist Residencies, Publications, Artist Talks, and other programming to the Rochester community. 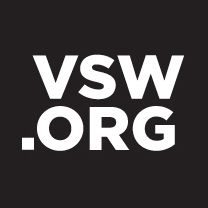 VSW is a 501(c)(3) not-for-profit organization. Donations are tax deductible.